In our San Francisco therapy practice, we help many couples whose relationships have been negatively affected by their use of (and addiction to) smartphones. It’s crazy to think how much one little super-helpful device can actually be the cause of so many problems in your life. The widespread use of technology impacts pretty much every facet of your life now – from the way you work to the way you watch TV and even the way you date and romanticize your partner. Arguably, the biggest reason for these changes is due to the increased use of smartphones in our tech-obsessed culture. In fact, the accessibility to your partner, and the expectation to always be available is greater than ever before. We can truly reach our partners in a matter of seconds – no matter where they are or what they’re doing. Texting, voice or video calls, or even the ability to check on your partner’s physical whereabouts through locator apps (don’t get us started on the can of worms this opens up! ), smartphone use has drastically impacted the ways you relate to your loved ones. For better or worse, technology has made keeping in constant contact with your partner feasible and rather expected. Now, one potential upside to our beloved smartphones is the fact that meeting your partner’s need for personal contact has never been easier. With the swipe of a finger, you can share a picture, video, or link to let your partner know you are thinking of them. And you can purchase gifts or send flowers with the click of a button. Though there are undeniable benefits to our use of smartphones, it’s hard to deny the downsides of having technology devices so prevalent in your romantic life. Smartphone use leaves little room for privacy in a relationship. It is very difficult to hold a conversation without your loved one wondering who you’re texting or speaking to. Using smartphones also generates a lack of space or individuality in your relationship as your romantic partner can easily tag or insert themselves into interests you pursue on your own. What’s more, there is an intense pressure that comes from the urgency to respond to your partner’s needs and demands without having a moment to pause or reflect on the request. But perhaps the more damaging type of smartphone use is when you or your partner start to use them other than a way to facilitate better and easier communication in your relationship. When you allow smartphones to become your main line of entertainment, connection to work and source of social stimulation, you allow smartphones to take over. Numb you to your surrounding world. When you’re actively using your phone, whether for work or personal use, it can be difficult to recognize the ways it may be negatively impacting your relationship. Because you often believe the technology use is necessary as a smartphone alert can take on a sense of urgency that you feel compelled to respond to immediately. You can be pressured to sacrifice quality time with your partner for a work call, a quick email, or to take care of business right away. Or, smartphone use can also feel like an easy way to blow off steam. When stressed, you can grab your phone to quickly check an app or escape by playing a game. Regardless of the reason for your smartphone use, you’ve convinced yourself that you are capable of dividing your attention equally between your technology AND your partner… AND still be able to meet their needs. The difficulty arises when it feels like you are competing with your partner’s smartphone for their attention or vice versa. It’s become normal to have a phone in one hand while having dinner, on a romantic walk, or even lying in bed together. The problem comes when you become so attached to your phone that you are no longer able to function without it. You become addicted and fuel this addictive behavior with the notion that your phone is essential to the way you operate in the world, including the way you maintain your relationship. Then your partner begins to feel like you’re in a relationship with your phone rather than them. How it takes away from your relationship. You can learn to identify what about their technology is problematic for you. Is it that you feel like you are competing with their phone for their attention? Is it that you feel lonely in the relationships as they are often on their phones? Do you find yourself arguing with them about their phone use? The key is not to accuse anyone of technology misuse and instead to communicate how you feel when the phone is always present in your relationship. Being on your phone all the time is a sure-fire way to communicate to your loved one that the news, social media, email, texts, funny videos, and work are more important to you than they are. When you use technology all the time, you’re often overlooking the most important things in your life, like your relationship. It’s too easy to justify your smartphone use (“quickly reading something”, “checking the weather forecast”, “firing off a short text message”). But what is actually happening is you are justifying addictive-like or compulsive behaviors and passing them off as helpful to yourself and your relationship. When you purposefully ignore what is going on in the present moment for the sake of numbing yourself with technology, you are encouraging a distance to grow within your relationship. You are allowing your personal and intimate connection to be replaced by a screen and expecting your partner to wait around for you to find time and energy to be present with them. This behavior fosters resentment within your partner as they start to feel second best or like you would rather be in love with your phone than them. When this happens, it’s not about assigning blame or acting like the problem doesn’t exist. Rather, it’s about taking ownership of your smartphone use and acknowledging its impact on your romance. When you do this, you can start to smartphone-proof your relationship while still utilizing technology in the ways that are essential, and actually benefit your life. 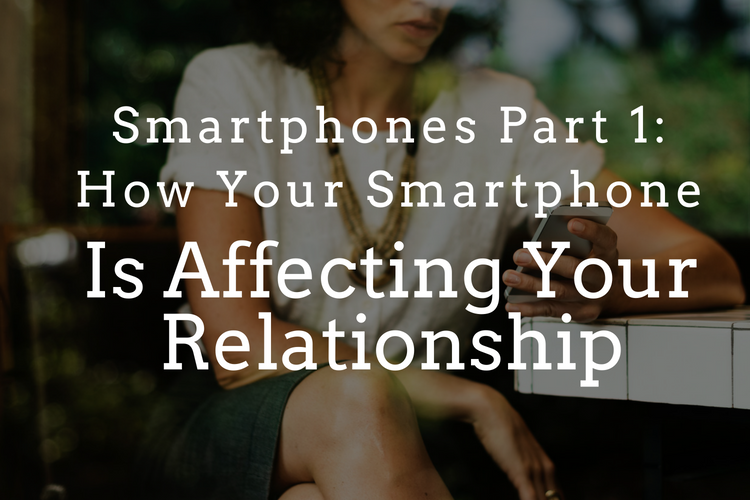 Check back next week for Part 2 in this series to learn 3 ways to stop your smartphone from ruining your relationship. Do you need help reconnecting in your relationship?